Hi Dan, tell us a bit about yourself (e.g. how you got into the industry, why you decided to develop websites). This is always an interesting question for me to answer; when I was growing up I had always wanted to be a chef. So that’s what I did, left school after my GCSEs, went to college to do an apprenticeship and got my qualification. Not long after getting my qualification the place I was working shut down. I faced the same issue most young people face which was not enough experience. So I was out of work for quite some time applying for jobs, however I needed something to keep myself entertained which I took a leaf out of my brother’s book (he’s a developer) and started teaching myself basic HTML. 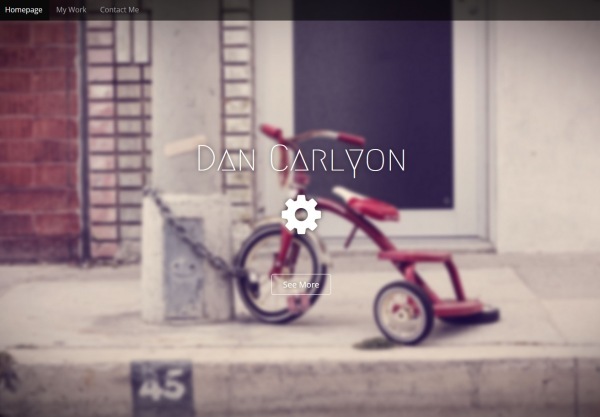 One of the things developers typically find challenging is creating a portfolio website that looks attractive and showcases their work well. What tips would you give to developers who aren’t so hot at design? KISS – “Keep it simple, stupid”. Keeping it simple is best in my opinion. If you have too much clutter or too many colours, you are distracting people who are looking at your portfolio. All you really need is a nice screenshot of it (as the website may change), a link so people can view the live site, and a bit of a synopsis explaining what you did, why and maybe a bit about who you did the site for. Other than that everything else is just clutter. The links to live sites are hugely beneficial as nothing beats being able to look at and interact with the live version of that site. 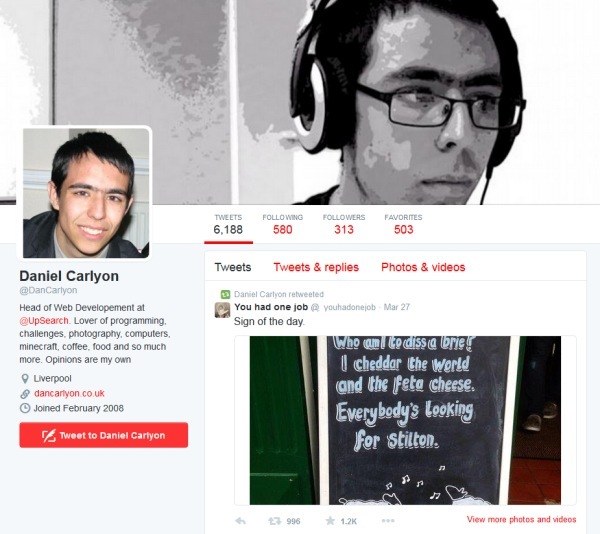 DanCarlyon. co.uk is a very minimalist website. Why did you decide to go down this route and what advantages does it have? This follows on from my previous answer. Minimalism is simple, it’s easy to read and look at. So many times you come across websites with things scrolling, flashing moving around or the content is clumped together you just don’t know where to look. Some just give you headaches and click away. Minimalism doesn’t mean you lack skills either; if anything it shows more skills being able to get your information across in a minimalistic way. Minimalism makes it easy to read, split content off into blocks so users can focus on one bit then move to the next, and allows you to get straight to the point with your content. Everything. 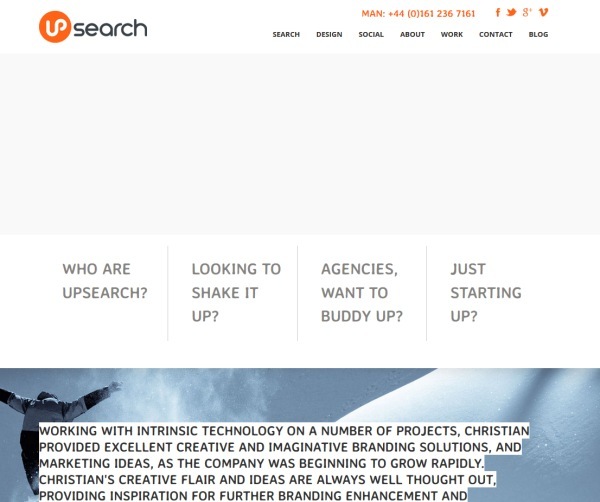 I currently work for a digital agency in Manchester called UPSearch Digital and being a digital agency it’s different every day. It’s always a new challenge, but at the same time I also get to work on projects that take weeks or more to develop. Each site and each client has their own specifics for the project and their own ideas about what they want/need from their website, so every project is different and presents a new challenge. Even if I had three WordPress- based websites lined up each one would have its own functionality that makes it unique to the rest. This rings even more true with custom bespoke builds. I recently got the chance to work on a large project for a B2B perfume wholesaler that challenged all of the developers involved with the functionality they were requesting, and it’s that challenge that makes developing fun and enjoyable. What advice would you give to someone looking to get into the web industry as a designer or a developer? Put everything you’ve got into it. There is no point in putting half of your effort into it. If you want to make it as either a designer or a developer you have to live and breathe it. You also can’t rely solely on a university degree. The digital industry is forever changing, trends are always changing with the times, you have to stay ahead of the game, read blogs, books, develop/design outside of work. This doesn’t mean you can’t have a social life, in fact it’s better to have that social life too, especially to interact and network with other developers and designers. You have to have a huge will and dedication to learn. Having qualifications means nothing if you don’t keep up with trends and what’s going on in the industry. If you could change one thing about the web industry, what would it be? Unifying browser rendering and compatibilities. It is my biggest bugbear when developing websites to need to have different code to make websites work in different browsers. Even to the point of responsive development, you have to have a bank of devices available to test and develop properly. Otherwise one day you have a client pop up saying it doesn’t work on the Latest XYZ phone, the one device you hadn’t tested on. Browser testing websites can only test so much – nothing beats actually testing it on the real browser/device. It would be a dream come true to have one lot of code that works on every device and browser in the world flawlessly and could cut development times and costs. Working with non-technical clients can be a huge challenge. What strategies would you recommend for dealing with clients who aren’t familiar with websites and domain names? This is indeed a difficult challenge but it can be solved with the KISS principles again. Keep it simple. Try and avoid throwing a load of acronyms and technical words at them, it may baffle them and make you feel smart because you know what they are but the client is not going to be any wiser for you saying them. Explain the processes without going too technical. For example, with domains you do not need to talk about the DNS or the TTLs. The client isn’t going to know what any of them are and most won’t even care or want to know what they are. Instead I would say, “We’re going to take your domain and point it to its new home, or to the new server, it’ll take up to X hours to complete and then it will be done”. With that you’ve told them that something’s going to happen, it’s going to take a bit of time, and then it will be complete. That’s all they really need and want to know. If they can understand that then their impression of you increases as they know you’re not trying to pull the wool over their eyes. All they really want to know is, 1) Are you dealing with it, 2) how long is it going to take, 3) what are the benefits of whatever it is you are doing and finally 4) how much is it going to cost. What hobbies and interests do you have that complement your role as a web developer? Why did you decide to host your website with us? The main reasons are price, reliability and ease of use. Those mixed together maker a killer combination. There have been times as well where I have had to open a support ticket and issues were answered and resolved very quickly (even non-urgent issues). The reliability of the domain name hosting has been second to none and because of that have no interest in moving elsewhere. Those first three points are what makes or breaks it in my opinion. What projects and challenges are you looking forward to in the future? This year I’m going to be attempting to get my Magento Developer Qualification which is really exciting. I’ve heard it can be quite a challenge but as you’ve probably guessed, I’m always up for a challenge. Equally exciting, there’s also expansion happening within UPSearch which will see me taking lead of the web department. There are also a couple of websites that I’m looking forward to putting live but unfortunately I can’t say too much about them. One is for a large magazine and the other is for a company that is rebranding which has allowed me some creative freedom. Hopefully this year I will also be able to attend more conferences like jQuery Conf and would be nice to get to a Smashing Magazine conference too.